It was ten days ago when Donald Trump blasted Bernie Sanders as “weak” for allowing his Seattle campaign event to be taken over by protesters for #BlackLivesMatter. 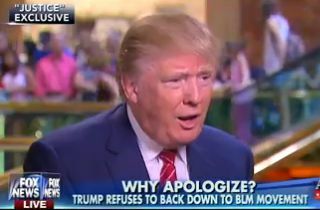 Today, Fox & Friends showed a clip of Trump expressing some choice words regarding Martin O’Malley‘s apology to black activists after his statement ended up sending the Netroots conference off the rails. The show was showing previews for an interview Trump had with Jeanine Pirro, where he mocked O’Malley for allowing the takeover to happen. Trump, of all people, then accused O’Malley of being politically incorrect by backtracking for saying “all lives matter,” which Trump noted was a true statement.